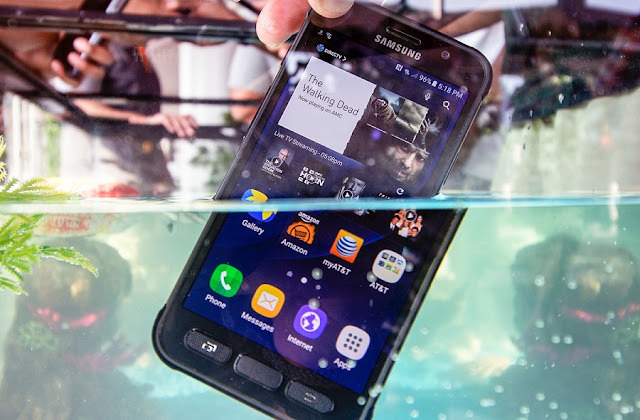 The latest Galaxy S7 is a waterproof device; but a submersion test done on the more rugged Galaxy S7 Active has shown that it may not actually be as waterproof as expected. Consumer Reports put the the Galaxy S7 Active water resistance to the test and things don't look good. The IP68 certification states that a device can be completely submerged in water for a long period of time, and CR put it in a pressurized tank, simulating a depth of 5 feet for 30 minutes. The device came out non-responsive, with the screen filled with colored lines, and water droplets inside its camera lens. To minimize the chance this was a defective unit, they repeated the test with a different Galaxy S7 Active, but again it failed - and even after a couple of days out of the water, both devices never recovered back to working conditions. This isn't the first time a smartphone manufacturers has problems with waterproof claims, as even Sony had to say that their waterproof smartphones aren't actually meant to be used underwater. Maybe Apple is doing it the right way... as it has been making its iPhones water resistant, but not claiming it. That way, you can't really call them out for not being as water resistant as it was supposed to be.